As a newcomer to the Munich High-End extravaganza, I was blown away by the unbelievable amount of high-end audio jewelry on display. Not only does Munich dwarf whatever is going on at CES, it dwarfs your preconception of how many brands of audio gear exist in the universe. However many you might have imagined, Munich makes it clear that there will always be at least one more. I had the enviable assignment of trying to figure out exactly what new analog gear was being unveiled at the show. Almost every room featured a new turntable or two, or three, and those weren’t even the rooms exclusive to turntable manufacturers. Without attempting to catalog the vast quantity of analog gear on display, and with apologies to those I simply missed, I found a number of new products in Munich worthy of attention by anyone who loves vinyl. Beauty is in the eye of the beholder, and on the third day of the show I came across this turntable/’arm/base combination that I thought was stunning. This is the latest DaVinci turntable and Grand Reference Virtu tonearm from DaVinci Audio Lab of Switzerland. Jon Valin dubbed a prior version a “gorgeous Swiss masterpiece” and this latest interpretation looks like a collaboration between Patek Philippe and Zegna. The artful DaVinci “tonebase” (mint green and electric red? Why not?) is the handiwork of Copulare, a German manufacturer of exquisite bases and stands for turntables and audio electronics. The DaVinci features a magnetically suspended platter of aluminum and brass. It will accommodate up to three ’arms via three separate tonearm bases. Price: approximately $44,680. The Virtu ’arm is made of ebony, steel, and aluminum and features a four-point magnetic-sapphire bearing. Price: $12,500. Continuing the trend toward all-in-one solutions for consumers, venerable SME introduced a very attractive analog front-end in its new Synergy turntable system. I thought this was one of the more important analog offerings at the show, as it represents a high-end approach to complete vinyl playback from one of audio’s most respected manufacturers, yet at a relatively affordable price. 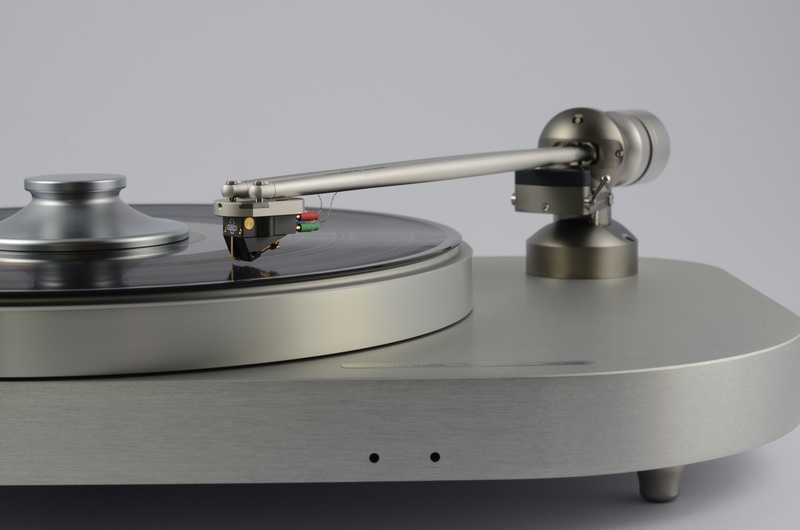 At a projected U.S. price of about $17,500, the Synergy package includes a completely new turntable combined with the excellent SME Series IV tonearm, Ortofon’s “exclusive series” Windfeld Ti cartridge and a specially designed phonostage by Nagra. All of the pieces are coupled with mono crystal silver wire by Crystal Cable. As you can see in the photo, all of this is included in two compact pieces that look exceptionally well-made, as would be expected from SME. The Synergy should be available in the fall of this year, and I am looking forward to hearing this integrated turntable. It seems only natural that the country famous for fine watches would apply those skills to the manufacture of jewel-like turntables. Besides the new Statement ’arm, I was very intrigued by the Thales TTT-Slim II turntable package that debuted at the show, all products of Switzerland. It appears that a lot of advanced engineering is represented by this slim turntable. First of all, the ’table is battery-driven, thereby eliminating a significant source of potential noise contamination. Micha Huber of Thales states that the battery offers over twenty hours of listening before it needs to be connected to the mains for charging. A suspended DC motor drives a flywheel at a speed 12 times faster than the aluminum platter. A short belt-drive system transfers the moment of inertia of motor and flywheel to the platter. The package sells for $12,500 and includes the TTT-Slim II ($6750), the Thales Easy tonearm ($5400) and the new EMT HSD 006 MC cartridge ($1300). Thales is known for its unique and excellent tangential pivoted tracking tonearm, wherein the ’arm utilizes two tubes and pivots to maintain theoretically zero-error tracking of the ’arm across the arc of the record. I don’t have personal experience with the ’arm but I have read and heard that the prior version worked very well and sounded great, although the design of the original Thales offset ’arm was somewhat awkward and would not fit on a number of turntables. Thales’ new Statement ’arm, shown on the TTT-Compact II turntable, eliminates those concerns. A close-up view of the ’arm shows that it now utilizes two slender parallel tubes which pivot at the headshell. The ’arm tubes are available in either gold-coated or rhodium-coated finish. The bearing unit is completely encapsulated and the entire ’arm truly resembles industrial art. VTA and azimuth are easily adjustable. From the battery power to the impeccable build-quality, to the tangential pivoted ’arm, this record-playing system is distinguished from the pack. I would love to hear the Thales ’table in my own system. Pricing for the TTT-Compact II is approximately $15,000 and the Statement ’arm will sell for $21,000. Munich was aflood with turntables and cartridges, many of which I had never seen or even heard of. With no slight intended to these other products, there is something special when Ortofon announces a new top-of-the-line cartridge to celebrate its 100th anniversary. (Actually, Ortofon announced two other new cartridges as well, the Concorde Century and SPU Century.) Without specific facts to guarantee the MC Century is lust-worthy, I am basing my estimation on the great sound I have heard from its predecessors, including the MC Anna. Ortofon claims to have developed a new “laser melting process” by which the titanium case is welded together, layer by layer. The cartridge is low-output at 0.2mv, uses ultrapure oxygen-free copper and features a diamond cantilever. While these features are interesting, with cartridges the proof is always in the listening. The MC Century ($12,000) is at or near the top of my list of new cartridges to audition. Aesthetix introduced a new optional internal phonostage for its Mimas integrated amp and Pallene preamplifier. As a longtime fan of the tube-laden and expensive Aesthetix Io phonostage, it was nice to see a Jim White-designed plug-in phono board at a modest price of approximately $1000. The board should greatly increase the functionality of both the Mimas and Pallene. It features fully discrete balanced circuitry and two inputs (the first both balanced and single-ended, the second is single-ended only). It offers up to 72dB of gain and will handle mm and mc cartridges. Happily, all functions of the phonostage, including gain and cartridge loading, are adjustable from the front panel controls of the Mimas or Pallene. So there is no need to take off the cover and start clicking dip switches or moving jumpers. Even more affordable than the turntables highlighted above is Kuzma’s new Stabi R turntable. I use a Stabi M at home and the Stabi R brings essentially the same drive system, with a high-torque DC motor and heavy metal platter, to a much lower price point. Built on a modular platform, the Stabi R is smaller than the M and allows the choice of metal or wood finish as well as the addition of a second tonearm plinth. Also on display were the basic chassis and ’table on which you could add up to four “wings” for additional tonearms. The electronic power supply is built-in. With a U.S. price of about $8000 (without ’arm), I would expect the Stabi R to offer excellent sound at a reasonably affordable price. Transrotor of Germany makes so many different products, it is difficult for me to tell where each of its turntables fits in the company’s product hierarchy. But Transrotor debuted a new ’table at the show, the Argo, that looks cool and is priced more comfortably at the lower end of the Transrotor spectrum. The Argo is the fourth iteration of Transrotor’s “Fat Bob” concept. It has a solid metal base, a very heavy platter, and Transrotor’s TMD magnetic bearing. They added to these a tonearm base that is easily adjustable in all directions, to accommodate different size tonearms. VTA is adjustable on the fly with a wheel on the base. The ’table, with one tonearm base and the Konstant Studio power supply will sell for approximately $5800 in the U.S.
Avid gave its Ingenium turntable a removable armboard and separate power supply (about $2000 with Pro-Ject 9cc tonearm). Also available at modest extra cost is a fancy mirror finish, shown here in purple. An interesting take on a direct-drive turntable was shown by Semper Sonus. It uses direct drive but without an idler wheel. Attached to the motor spindle is a urethane drive wheel that gently presses against the inside of the platter (and moves away from the platter when not in use). It was on static display; U.S. price will be about $7000. Another interesting ’table was the Seismograph Model 2 from SoReal-Audio (Germany), beautifully made of solid aluminum and with the ability to handle two ’arms. Seismograph is looking for increased distribution in the U.S. and the pricing will be about $22,000 without ’arm. Musical Surroundings also had a number of new products on display, one of which was a separate add-on armboard for the AMG Viella turntable. The new “Fortissimo” armboard ($2500) allows the addition of a 9" or 12" second tonearm to the Viella. In other news from Musical Surroundings, Clearaudio now offers a Concept Smart Power battery power supply ($800) for the Concept turntable line, allowing pure DC to the motor. Also on display from Clearaudio was the new Smart Matrix Silent record cleaning machine, at an introductory price of $2200. It cleans one side of the record at a time and is said to be much quieter than most cleaning machines. The latest version of the Phonomena phonostage is now the Model III ($1200) and features a larger power supply as well as a mute switch and a subsonic filter switch. AVM of Germany was showing its new 5.3 turntable, made by EAT to AVM’s specifications. This ’table immediately stood out because its frosted acrylic platter was glowing in a soft blue; the light under the platter can also be switched off. Acoustic Signature had on display its new “Double X” turntable, with a choice of two high-gloss wood finishes and featuring layered aluminum construction of the plinth ($4500). One of the most fun products I saw in Munich was Pro-Ject’s new “Juke Box,” shown here with Pro-Ject’s very happy president, Heinz Lichtenegger. This all-in-one system is a turntable with built-in phonostage, aluminum tonearm with pre-mounted Ortofon OM5e cartridge, amplifier, and Bluetooth receiver all in one slim box (approximately $500). An acrylic dust cover is included. Just add two small speakers and you’re in business. While I did not get to hear every room, I’m sure I heard a majority of the rooms and there were a surprising number that sounded excellent. Six stood out in particular, cost no object. First, I was knocked out by the new Raidho TD-4.8 loudspeakers, driven by top-of-the-line Chord electronics. Shaped almost like a tall airplane wing, tapering to the back with sides finished in beautiful walnut, each speaker sports Raidho’s sealed ribbon tweeter, two ceramic-tantalum-diamond midrange drivers and six smallish (6" diameter, perhaps less) ceramic-tantalum-diamond bass drivers. They were in a large room, and the speakers easily filled the space with a cavernous presentation, laser imaging, and amazing dynamic punch for drivers so small. (How do they do it?) The sound was evenly balanced, perhaps a touch of brightness in the upper midrange that could have been an artifact of the speaker, or the room, or the electronics. In any event, a stunning presentation. Also stunning was the sound in the Absolare room. Using the Kronos Pro Turntable as the source, Absolare’s new hybrid Passion power amps (solid-state output, tube input, $60,000 each) were driving Rockport Lyra speakers, which I had not heard before. Amazingly transparent and present, the room was a respite from all the noise, and the equipment simply disappeared. An absolute pleasure. I was also amazed by what Zellaton was able to accomplish under show conditions. I had not been particularly impressed with Zellatons at prior shows, but this was a different story. The maker’s Statement Loudspeakers, driven by YS Sound electronics, with a Soulution phonostage, Reed 3C turntable (first time I had seen this, yet another very cool turntable shown at Munich), and Schnerzinger wiring and Giga Protection, sounded sensationally transparent. Woodwinds and horns, in particular, sounded in-the-room present. For the first time in my writing life, I am putting Magico speakers in my best-of- show category. Perhaps in the past I hadn’t heard them under ideal conditions, or maybe they always seemed a touch dry and analytical to me, but Magico’s new M6, driven by Soulution 7 Series amplification and a Kronos front end, displayed everything I look for in loudspeakers. They were very transparent, evenly balanced top to bottom with a surprising amount of slam. Most of all, they sounded warm and engaging like real music. Congrats to Magico and Soulution. I am compelled to give nods to two other cost-no-object systems that sounded great at the show. Stein Music was demonstrating its enormous Top Line Bob–XL flagship speaker (yes, it’s called Bob). The XL should be called XXL, as it is an approximately 90" tall four-box system consisting of a vast quantity of dynamic drivers as well as a horn midrange and tweeter (about €128,000/pr. for main speakers, €88,000/pr. for Bob subwoofers). The fairly slender main towers each contain 18 upper bass and midrange drivers, in addition to the two horns. Two separate towers each contain eight 18" subwoofers with built-in 3000W amplifiers and digital room-correction capability. Front end consisted of a Tone Tool Trapezium turntable with two different Stein Auralit tonearms and Stein Aventurin 6MC cartridge. Amplification was Stein StateLine phono and HighLine integrated amp. I thought “no way” could all of these speaker drivers make a coherent presentation, but lo and behold the sound was seamless and even delicate when need be, exceedingly transparent, yet offering the kind of space and punch you would imagine with the capacity to move that much air. The system was complex but when the stylus hit the record, those in attendance heard a compelling performance of whatever music was being played, with a beguiling natural texture and body that was not overblown. Very good stuff. The final entrant on my cost-no-object chart, I truly enjoyed the sound in the Wilson Audio/Constellation room. Wilson’s Alexia 2 speakers were driven by Constellation’s Centaur II monoblocks, a combination I had not heard before. Front end was a Continuum Obsidian turntable followed by Constellation Perseus phonostage and Virgo II linestage. I had never really warmed up to the Alexias at prior shows, finding them slightly analytical, but the Constellation electronics seemed to bring them to life. The sound was very transparent, liquid and engaging, sounding neither analytical nor, for that matter, solid-state. I returned to listen a few times and left with a new appreciation of the Alexias and solid-state electronics; the Constellation gear, to my ears, bordering on tube territory. I was pretty impressed by some moderately priced speakers that I had never seen before and that may or may not soon be distributed in the U.S. Lumiks, a German company, was showing a speaker system reminiscent of old Gallo loudspeakers. The SAT K2 main speakers (satellites) contain three ceramic spheres held aloft a slender tower. The two larger spheres each hold a 10cm bass/midrange driver, each flanking a smaller central sphere holding a 30mm fabric tweeter. Behind these satellites sat, at floor level, a much larger ceramic sphere housing a 25cm (approximately 10") subwoofer (Sub W45). The subwoofer is powered by a Lumiks DSP bass module. The satellites were driven by a line of Swiss tube electronics made by Eternity-Jo. Price of the complete speaker system—satellites, sub, and bass amp—is €12,900. For this you get a system with a relatively small footprint that sounds like speakers three times their size. The soundstage was huge and the satellites effectively disappeared. The subwoofer nicely balanced out the satellites and the overall presentation was amazingly coherent, very smooth, and almost electrostatic-like—except this system has a lot more slam and drive than any electrostat I’ve heard. I’m hoping this product makes it Stateside. As an analog guy, I’m going to go with the SME Synergy and Kuzma R turntable systems discussed above. They are (very) far from the flashiest products I saw at the show. The Synergy is basically plug-and-play and the Kuzma would seem to offer a level of performance usually not available for a turntable priced well under $10,000. I also have high hopes for the Ortofon MC Century cartridge, but its pricing falls in the luxury category. The proliferation of analog gear is truly amazing. I’ve never seen so many turntables, ’arms and cartridges; more are on the way. While a good part of the world is working on ways to digitally stream music into our homes, the other part has come to recognize the inherent beauty and purity of analog. It’s a trend that won’t stop. Next most significant trend: all-in-one products that make it easier to get up and running—fewer boxes that do almost everything. I’ll stay true to my report and go with the DaVinci turntable with Virtu tonearm and matching Copulare base. How can anything that pretty not sound good, right? The Ortofon MC Century is close behind and if price were no object, sign me up for the Raidho TD-4.8 speakers. I wouldn’t even need to plug them in—I could place them next to the DaVinci and just look at them when I got home from work.